In case you haven't figured it out by now, I am a little obsessed with Lanvin. I think Alber Elbaz is a genius for many reasons, but primarily because he creates incredibly flattering dresses that women want to wear. It should be noted that his shoes are equally wonderful; I own a pair of the ballet flats, and not only are they tres chic, they're some of the most comfortable shoes I own. But lately, what's really been catching my eye is the costume jewelry--more specifically, the necklaces. 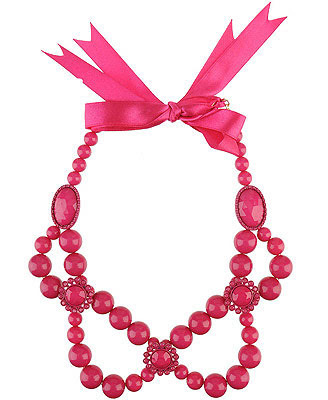 Often strung on satin or grosgrain ribbon, they're beautiful jeweled clusters with pearls or beads or crystals. The show-stopper this season is enamel; expect to see it knocked off from here to eternity. This Lanvin enamel necklace is the one inspiring this entire post. 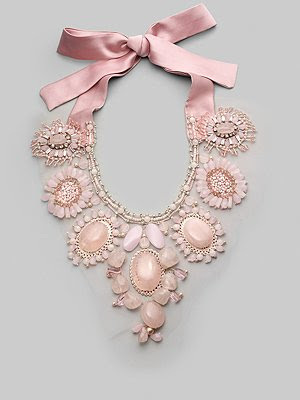 It's so overtly feminine--and, hello, pink--which I normally stay away from, but for some reason, I totally want this necklace. I would wear it with something simple, like a ribbed tank top. Then again, at $2,600, I think I'd have to wear it with everything in my closet. 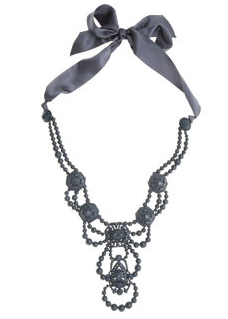 Here's another Lanvin enamel necklace; this one being gray, it's much more up my alley. It doesn't quite have the impact of the previous style, but it's, dare I say, slightly more versatile since it's more neutral in color. 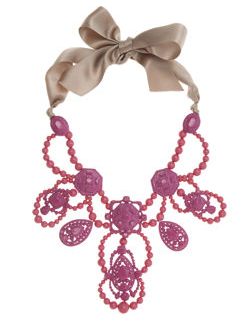 If the Lanvin necklaces give you sticker shock, this Ranjana Khan necklace is luxurious without being such a splurge. And, unlike the Lanvins, it's actually made of semiprecious stones--in this case, rose quartz. This Kate Spade Mariposa Fleur necklace is similar in color to the Lanvin, as well as in its unapologetically girly look. 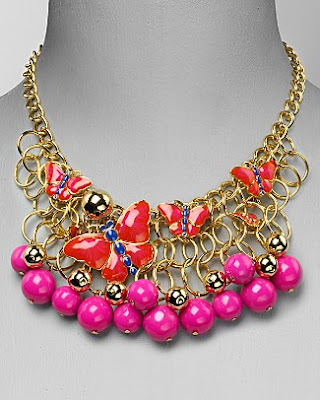 It's a lot of necklace, and it's not for everyone, but it's definitely a statement-maker. Also similar in color to the Lanvin necklace is this Lee Angel Anik necklace. 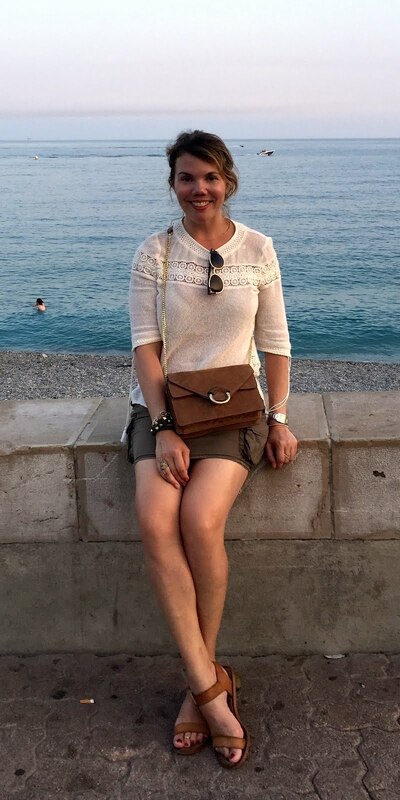 But since the beads are pretty much uniform in size (although there are a lot of them), this one seems easier to wear than the Kate Spade necklace above. 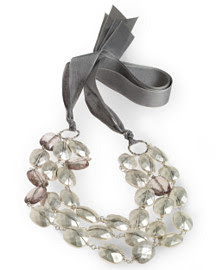 This Anthropologie necklace has the clustery pearl look of a lot of Lanvin's other necklaces. Being white and not pink, it's much more versatile in terms of what you can wear with it. 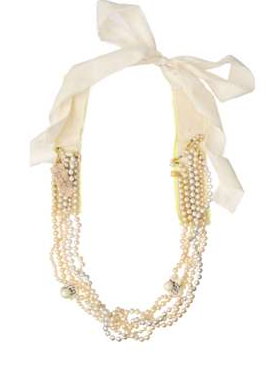 This multi-strand necklace from Newport News is similar in idea, but much more simple in execution. I think the metallic beads are really pretty, though, and, again, the neutral color scheme allows you to wear it with a lot more items in your closet. 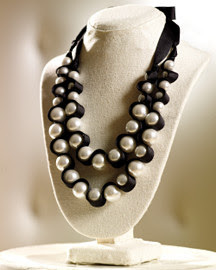 This faux pearl necklace from Spiegel is, again, not quite what I'm looking for, but it's very similar to a lot of other Lanvin styles; with the pearls and black ribbon, it also has a Chanel-like effect. But, lo and behold, leave it to Forever 21 to do the most literal--and most affordable--knockoff. Yes, this beaded loop necklace is a simplistic version, but it's also $10.80, and for that price, who's complaining?